Earlier this year we road tested the Hyundai Genesis in the UK and we liked it! For the 2016 model they’re adding even more. 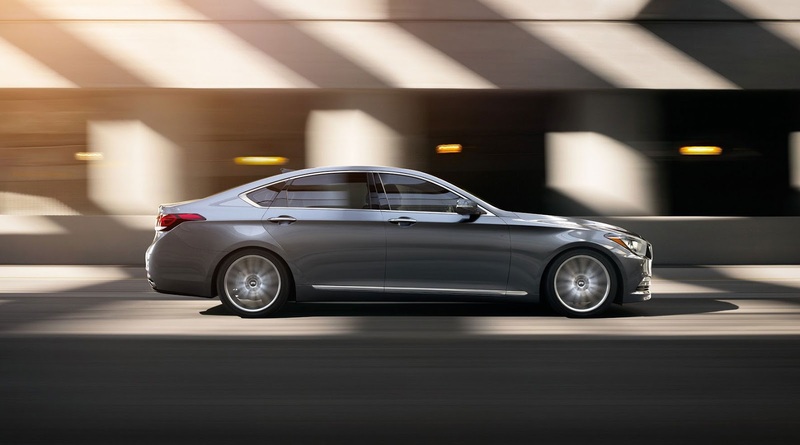 Hyundai continues to add compelling premium-market appeal to the Genesis saloon for the 2016 model year. HID headlights and LED Daytime Running Lights (DRLs) are now standard for 2016, while ultra-premium LED fog lights are now available on the 3.8 model, further enhancing the Genesis exterior lighting signature. represents a bold step forward for the Korean motor manufacturer, building upon its successful strategy of marketing its premium models under the Hyundai brand umbrella, rather than a costly, separate luxury brand sales channel. The 2016 Genesis is very well-equipped in every configuration, offering even more content than the first-generation Genesis. This includes a generous suite of standard safety and convenience features, unsurpassed in its class. A sophisticated AWD system is available, known as HTRAC®,, which has broadened Genesis appeal in the snow belt regions throughout the U.S and other countries where snow is an issue. Since its 2009 debut on the Sonata sedan, Hyundai’s Fluidic Sculpture design philosophy has been continually enhanced and refined, progressively influencing every model in the Hyundai line-up. The 2016 Genesis is the second generation of this convention-shattering design theme. If any more proof was needed of Hyundai’s excellent design strategy and visions for the future, you need not look further than one of the most beautiful cars unveiled in 2015, the Hyundai Vision G Concept. We published a gallery and details of this car on the Luxurious Magazine Google Plus page and our readers absolutely loved it, thousands of people each minute were looking at the article and the praise for the Hyundai design philosophy was universally positive. Fluidic Sculpture encapsulates a trio of main design elements: fluid aesthetics, the modern Hyundai look, and a premium ambiance. Fluidic forms are present but with a refined and precise presentation. This latest design philosophy is adaptable to a wider range of vehicle types and sizes, from CUVs to premium-luxury flagships. 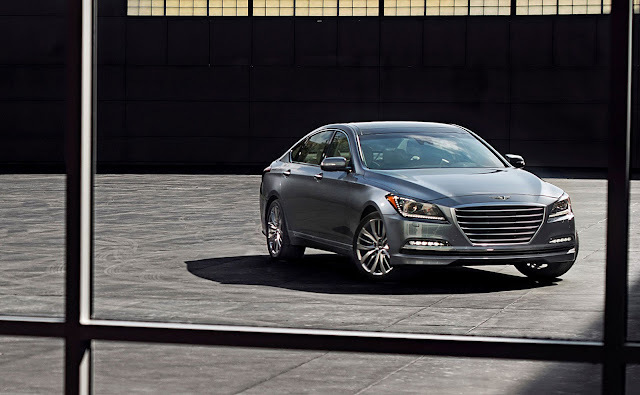 The Genesis offers a modern design through a distinctive exterior style coupled with a sleek, upscale appearance along the lines of other well-specified cars in this segment. Unlike the Vision G Concept, it’s not a car to make you go wow, rather a good combination of good design and practicality in equal measures. The design features the modern Hyundai look, with a hexagonal front grille as a key geometric element, a dynamic crease accent running along the flanks of the car, and an attractive rear design. Design surfaces convey a kinetic elegance, relying more on voluminous body sections than surface details to create dramatic forms. Proportions demonstrate a long dash-to-axle length, longer wheelbase and shorter overhangs than its predecessor. These proportions clearly convey the performance rear-drive configuration beneath the sheet-metal. The single-frame 3D-hexagonal grille is depicted in semi-gloss chrome and encompasses standard HID headlights, LED Daytime Running Lights and available LED fog lights. In profile, the Genesis daylight opening is expressive, with fluid lines and blended surfaces, a sleek C-pillar helping to emphasize the sporty styling. The rear of the Genesis benefits from a sculptural aesthetic with jeweled, full-LED taillights. The cabin layout of Genesis has been designed to benefit all occupants with a spacious, comfortable ambiance. The simplification of the switchgear and instrument panel ensures an intuitive layout and open feel. This user-centric design has sought to connect the various interior parts effectively, particularly the center stack with the console, upper-instrument panel and B-pillar with the headliner. Genesis displays ultra-precise fit and finish, with ergonomic seat design and a generous, natural feel. Particular design attention has been paid to the storage of practical items such as mobile electronics of all shapes and sizes, along with the flexibility of the cup holders. Total interior volume is an impressive 123.0 cubic feet, an advantage over key competitors. 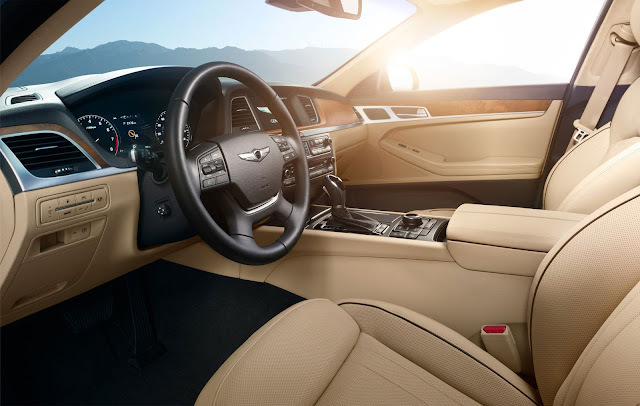 As part of this spacious interior design, the Genesis provides best-in-class front headroom and rear shoulder room. Hyundai interior design principles – safety, intuitiveness, and simplicity – guided the Genesis design team in designing all primary controls to deliver maximum ease of use. Ergonomic ease of reach and control have been meticulously evaluated and executed using a specially-designed laboratory tool created to measure occupant operational force for ergonomics. The interior surfaces have been developed to decrease relative interior reflections and brighten dashboard surfaces while high-grade materials such as genuine aluminum and matte-finish wood are available. Cohesion between the center fascia and audio controls has been ensured through a streamlined design, making the two separate sections appear as one. To ensure a luxurious feel, Genesis was intensely scrutinized for its use of materials, with extensive analysis of the relationship of different materials, their texture and color coordination. Driver and passenger posture are optimized using enhanced seat pad density, improved seat support technologies, such as adjustable driver’s seat power bolsters and seat cushion extension. Genesis offer 12-way power front seats, including 4-way power lumbar, heated front seats with available ventilation, as well as heated rear seats on HTRAC AWD models. Seat materials and stitching quality utilize double, rather than single stitching. The driver’s seat incorporates functionality with an available air pressure pump and controller valve, providing seatback bolster adjustment through individual air cells located in the seat. With a total operating time under 8-seconds, the Genesis benefits from both a faster activation process and greater range of adjustment than many competitive rivals. The platform upon which the 2016 Hyundai Genesis is built employs advanced high-strength steel, composing over 50 percent of its total platform composition. The benefits of strategic use of high-strength steel are immediately evident in torsional and bending rigidity. As a result, the Genesis is stiffer in both torsional and bending rigidity than the BMW 5-series. Ensuring a smooth ride over rough roads was a top development focus, achieved by a robust connecting structure, extensive laser welding, reinforced body and chassis mounting points, hot stamping and dipping techniques for the B-pillar and roof sides, and a high level of high-strength steel in the chassis. Front shock towers are made of aluminum, and a diamond-shaped strut bar maximizes front structure rigidity for precise steering response. Fully leveraging this rigid chassis is a rear multi-link suspension, with optimized 5-link geometry and increased suspension travel for a broader envelope of both dynamic performance, and ride comfort. Lateral suspension stiffness and overall ride comfort refinement were top priorities in its dynamic development. The fully-independent, 5-link front and rear suspension designs have increased stiffness compared with the original Genesis, with increased front and rear suspension travel, for greater wheel articulation and bump absorption over a variety of road surfaces. 18-inch and 19-inch alloy wheels resist deflection forces for precise suspension response to changing road surfaces. Handling and road holding also benefit from a well-balanced 52/48 ratio of front-to-rear weight distribution. In addition, special focus was given to the development of Rack-mounted Motor Driven Electric Power Steering (R-MDPS), with a Variable Gear Ratio (VGR), helping to provide high-speed stability and a direct feel at low and medium speeds. These driving qualities are attained while retaining the incremental fuel economy benefits of an electric system over the higher parasitic losses of hydraulic systems. 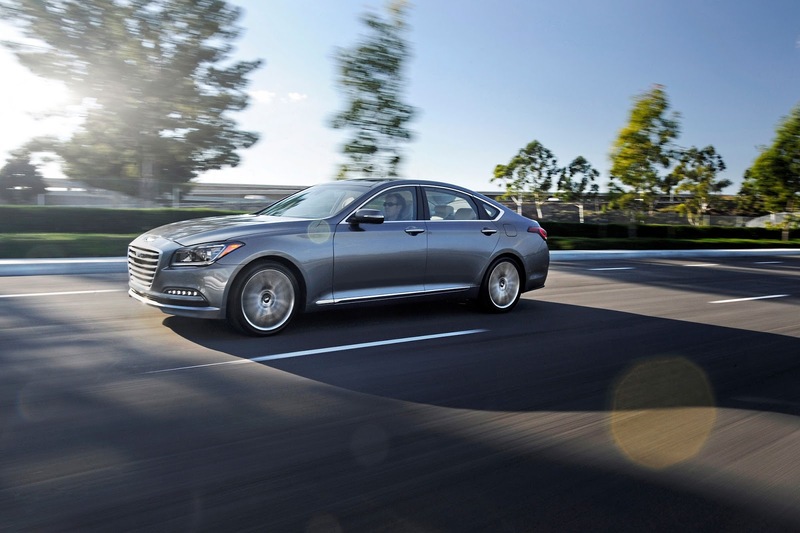 The Genesis is offered with a choice of rear-wheel-drive or HTRAC® All-Wheel-Drive (AWD) configurations. The HTRAC AWD system was developed as a multi-mode system, providing an electronic, variable-torque-split clutch with active torque control between the front and rear axles. The driver-selectable HTRAC Normal and Sport modes help provide confident control in all-weather conditions. The Sport setting gives a more agile feel by sending more available torque to the rear wheels, for a sporty rear-drive dynamic feel when desired. Further, to maximize efficiency, the system can direct more available torque to the rear wheels during steady-state highway cruising for reduced drivetrain frictional losses and noise. This system has a wider range of torque distribution variability than many competitive systems and has been tuned to variable conditions such as straight-line acceleration, medium- and high-speed cornering, and hill-starts. All modes are programmed in concert with Genesis’ Intelligent Drive Mode select. The Genesis employs a suite of active driver safety technologies dubbed Sensory Surround SafetyTM. These features cover the full spectrum of safety, from driver alertness and focus to total occupant safety, and even the safety of other drivers around you. These features are supplements to the driver’s safe, attentive driving. Genesis offers Automatic Emergency Braking (AEB), utilizing sensor fusion technology to help avoid a potential collision or reduce its impact in certain circumstances. With this supplemental system, Genesis will employ automatic braking when it detects another vehicle at an unsafe closing rate of speed. This system uses the Smart Cruise Control system and the forward camera from Lane Departure Warning (LDW) to provide this extra margin of safety. Genesis’ Smart Cruise Control (SCC) incorporates stop-start functionality that functions seamlessly with the standard electronic stability control system. This system for Genesis allows full function down to zero mph to operate seamlessly in stop-and-go traffic conditions, using the front-grille-mounted radar sensor. SCC enables the Genesis to help maintain safer, consistent spacing with the vehicle ahead in varied traffic conditions. The system can also help deploy an available Automatic Emergency Braking system should an impending collision situation be detected with a vehicle ahead. 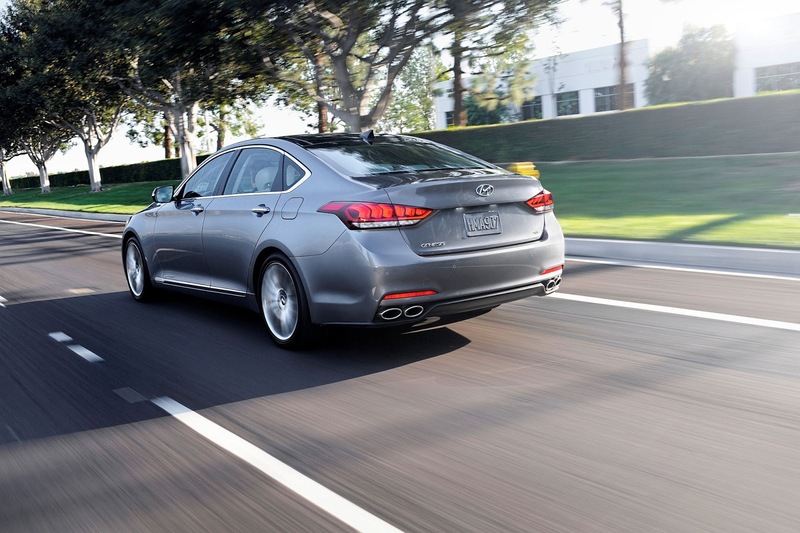 Genesis is generously equipped with advanced technologies, many of them Hyundai firsts. A driver-selectable Intelligent Drive Mode allows drivers to select from four drive modes depending on conditions and driving preferences. Each drive mode alters transmission mapping, throttle responsiveness and stability control, with specific modes adapted to function seamlessly with HTRAC AWD for those Genesis so equipped. Genesis also offers a Blind-Spot Detection system (BSD), which helps monitor traffic around the car and supplements the driver checking their surroundings. The system uses radar sensors in the rear bumper to help warn the driver of an approaching vehicle in his or her blind spot via an indicator on the side mirrors. If the driver activates the lane change indicator and attempts to change the lane, ignoring warning indicators, BSD additionally issues an audible warning and haptic steering wheel vibrations. In addition, for Genesis’ equipped with the Head’s-Up Display, the BSD system indicators also project onto the windshield, nearer the driver’s view of the road, a segment first. Lane Change Assist (LCA) performs a similar function to help detect vehicles approaching towards its rear side at high speeds, especially during higher-speed driving, while Rear Cross-traffic Alert (RCTA) scans areas to each side of the car when drivers are backing out of parking spaces. No other sedan in Genesis’ class offers the combination of Blind-Spot Detection, Lane Change Assist, and Rear Cross-traffic Alert active safety systems. From the front, the available Lane Departure Warning (LDW) captures images of lanes and recognizes the lane marker. If LDW detects lane departure, a warning signal is activated on the instrument panel while issuing a haptic steering wheel vibration warning. Working in concert with LDW, Genesis’ Lane Keeping Assist (LKA) performs a similar function of LDW, but LKA additionally provides a driver-adjustable level of steering assist to help prevent inadvertent lane departure when a vehicle approaches the edge of a lane and also provides steering wheel haptic vibration feedback. For convenience and safety, a High-beam Assist (HBA) function is also available. When switched to automatic mode, it detects both oncoming vehicles and vehicles in the same lane ahead at night and changes to low-beam as appropriate, reducing blinding effects on other drivers. Whenever there are no vehicles detected, the system automatically re-activates the high beams, maximizing the driver’s range of vision. To maximize driving visibility, Genesis offers HID headlights with dynamic auto-leveling that compensates for varying vehicle loads. To help ensure maximum driver alertness, Genesis also benefits from a world-first technology in its CO2 sensor control system, located under the glove box. 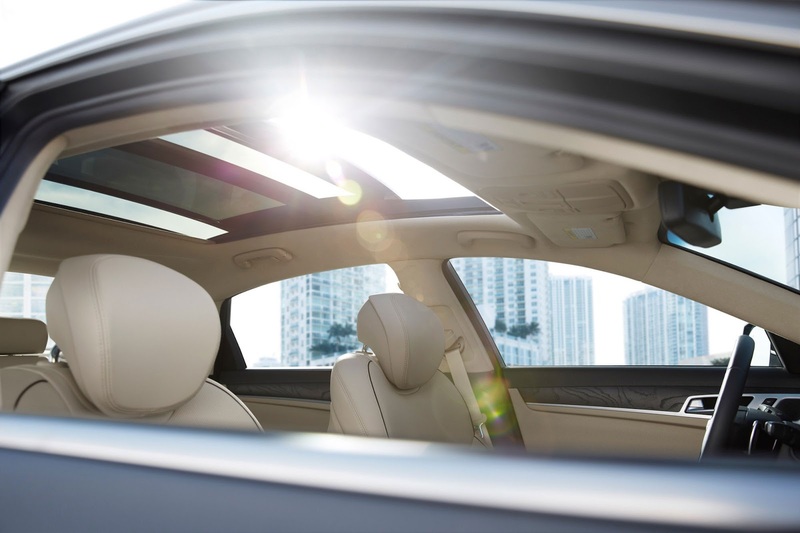 Hyundai engineers discovered that occupants start to get drowsy when CO2 levels reached more than 2,000 parts per million, so the ventilation system helps ensure the cabin maintains a CO2 concentration well below that level at all times using freshly-ventilated ambient air. The system monitors the vehicle’s intake of fresh or re-circulated air using a dedicated CO2 sensor. 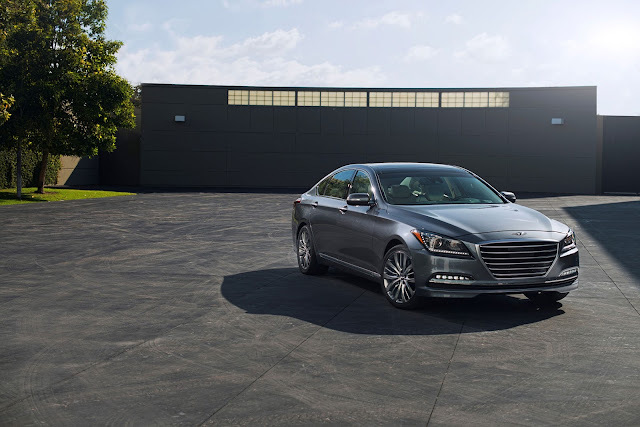 The Genesis also offers a parking assistance system with eight ultrasonic sensors located on the front and rear bumpers. The sensors, along with the rearview camera, help detect how close objects are when parking. Distance is indicated on the in-dash screen and accompanied by an audible warning tone. How Quiet is the Hyundai Genesis? Aside from a luxurious and well-styled interior and exterior and the price, the ride quality is probably the next most important aspect considered by prospective purchasers for cars within the premium/luxury sector. In pursuit of refined quietness within the Genesis cabin, Hyundai engineers analyzed idle noise and vibration, acceleration, road and wind noise, and audible booming throughout the bodyshell. Sound-absorbing materials and a low-noise fuel pump have been fitted, cowl bulkhead insulation and sealing improved, and vibrations minimized through an improvement in overall bodyshell rigidity. Insulation of the rear differential helps reduce booming and vibration, resulting in lower audible noise inside the Genesis passenger cabin. During acceleration, sound quality has been achieved through mid- to high-frequency noise reduction, and dynamic engine sound improvements were achieved through intake and exhaust system tuning. Most Genesis competitors with hands-free trunk opening technology use a leg-kick sensor under the rear bumper to enable the driver to open the trunk. Hyundai ergonomics engineers found this method to be difficult when an individual is carrying cumbersome packages, such as from shopping. So the Genesis Smart Trunk system was designed to open the trunk automatically if the smart key is detected in a pocket or purse within a few feet of the rear bumper for longer than three seconds, for maximum hands-free ease of opening when desired. This system allows the driver to keep both feet comfortably on the ground, simply waiting by the trunk a few seconds for it to open automatically. The Smart Trunk system also provides an audible warning and flashing light prior to opening. Taking inspiration from aircraft technology, an available Head’s-Up Display (HUD) projects a virtual image onto the windshield, enabling the driver to keep his or her eyes on the road using a system of mirrors combined with a TFT LCD display. The system utilizes a widescreen with adjustable brightness to ensure both excellent daytime and nighttime visibility. Driving information such as speed, Smart Cruise Control status, navigation, Blind Spot Detection, Forward Collision Warning, speed limit, Lane Departure Warning and audio system data is projected at a perceived virtual distance approximately six feet ahead of the driver for maximum legibility while driving. Genesis also offers an electronic parking brake with Automatic Vehicle Hold for convenience when driving in traffic. Automatic Vehicle Hold automatically holds the Genesis at a stop until the accelerator pedal is depressed, such as at a traffic signal or in stopped traffic. The vehicle hold re-engages whenever the vehicle is brought to a complete stop. Genesis also includes proximity-key entry convenience with push-button start as standard equipment. For audiophiles, Genesis offers an ultra-premium, Lexicon® Discrete Logic 7 Surround audio system with 17 speakers, Logic 7 Surround Sound processing and 12-channel digital amplifier with 900-watts of equivalent output, sure to satisfy the most demanding listeners. This system also includes SiriusXM® Radio, HD Radio, and iPod/USB auxiliary media input jacks. The standard Lexicon system offers 14 speakers, with Discrete Logic 7 Surround processing and a 12-channel DSP amplifier with 900-watts of equivalent output. An optional premium DIS navigation system for Genesis offers a 9.2-inch High Definition display, with 720p high definition (a segment first), a 64GB Solid State Drive (SSD) for multimedia, and premium Lexicon audio system. This premium system also includes Gracenote® album art, junction view with lane guidance, advanced voice recognition, and music/image/video storage via USB download (approximately 30GB of usable storage). The standard audio-navigation system, displayed by an 8.0-inch touchscreen, is packed with integrated technology, from Bluetooth to navigation, satellite and HD radio, hands-free and app-supporting software. Genesis cluster displays utilize high-resolution, electroluminescent TFT LCD technology, with a standard 4.3-inch TFT LCD cluster display, and an available 7.0-inch TFT LCD cluster display. A simple pop-up message appears to help pair a phone and the voice recognition software understands street addresses and cities all in one sentence. The route screen displays speed limits, details the next three maneuvers, shows real highway signage and has junction views with lane guidance. Lane guidance outlines the lane or lanes the driver needs to stay in when a highway splits. Junction view uses street and actual road sign images to match what the driver will see when arriving at the next maneuver. The Genesis is one of those head rules the heart premium cars. It offers a large amount of tech and excellent comfort and refinement in a competitively priced package. 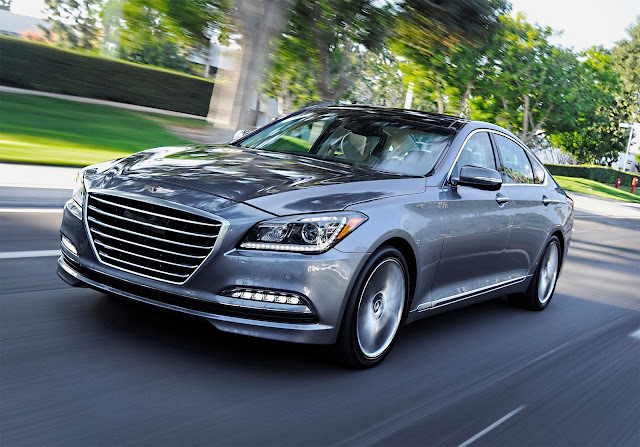 The 2016 Genesis will probably not garner too many admiring gasps and admiring nods for its looks, but should get acknowledgment from those that have already been through the looks above all else phase. The premium/luxury segment is a tough one to force your way into and perhaps a ‘sharper suit’ would have helped. Given the competition already in the market, the Genesis might not become more than a niche car which might suffer when it comes to residual values. I’m personally hoping that Hyundai are using the 2016 Genesis as a test-bed before moving all that is great about the Genesis into the Vision G Concept, launching this as its replacement and becoming a dominant force in the premium luxury sector just as Lexus did.